Tipperary advanced to the Munster final as they shocked the 14 men of Limerick 1-22 to 1-13 at Semple Stadium in Thurles. The reigning All-Ireland champions were dominated in the first half and after Barry Murphy missed a last minute penalty, they trailed 0-13 to 0-05 at half-time. Tipperary were outstanding from open play and scored at will from long range, with Mark Kehoe on target on four occasions, and David Gleeson scoring a second-half goal. Limerick came with a late fightback and Kevin Howard scored their goal but it was too late, as their captain Kyle Hayes was sent-off for a second bookable offence. Tipperary made a fast start and raced into a 0-4 to 0-0 lead after just seven minutes. Jerome Cahill scored their first point in the fourth minute, and further points followed from Brian McGrath (free) and Jake Morris (two). Tipperary senior star Morris reverted to the half-forward line and caused trouble there, while his Limerick counter-parts found it difficult to get into the game. Senior star Seamus Flanagan was uncharacteristically quiet. But Brian Ryan and Conor Boylan ate into the Tipperary lead, halving it, before Tipp scored another four unanswered points between the 11th and 18th minutes. Colin English and Kehoe both accounted for two each, before Barry Murphy registered his first point. Ger Browne and Murphy traded points thereafter, but Tipperary always looked more comfortable. They went on another four-point blitz, Kehoe scoring twice while Morris and McGrath added to their tallies. 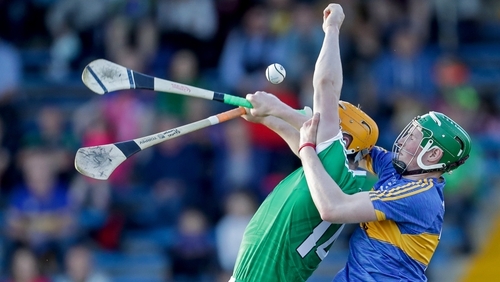 Willie O’Meara hit back for Limerick and they almost grabbed a crucial penalty goal before the break. But after he earned the penalty, when fouled by Killian O’Dwyer, Murphy blasted his shot off Ciarán Barrett’s crossbar and the ball was cleared to safety. Limerick had their chances in the second half but they result was put beyond doubt as early as the 39th minute when McGrath’s clearance was collected by Gleeson and he finished low past Jamie Power in the Limerick goal. Limerick were always going to come with a late drive and their substitutes contributed 1-3 with Howard’s goal arriving in the second minute off added time. But Hayes had already been sent-off for a second yellow, when he connected with Cian Flanagan. Tipperary will play Cork in the decider on 4 July. Limerick manager Pat Donnelly announced he was stepping down in the aftermath of the defeat. "I have been involved with this group since U-14 and had a fantastic time all the way up along with these lads and it's been reasonably successful so I have no complaints," he told the Limerick Leader. "We had some good days but this is a bad day,"
"Maybe it's time for some new blood. The U-21 is gone back to U-20 next year so it will be a different team so it might be somebody else's job. I had planned this anyway but it's disappointing to go out with a performance like this." Tipperary: Ciarán Barrett; Podge Campion, Brian McGrath (0-03, 0-03f), Killian O’Dwyer; Cian Flanagan, Paddy Cadell, Dillon Quirke; Ger Browne (0-02), Colin English (0-03); Jake Morris (0-03), Paudie Feehan, Jerome Cahill (0-01); David Gleeson (1-00), Mark Kehoe (0-05), Lyndon Fairbrother (0-03, 0-03f). Subs used: Cian Darcy (0-01) for Fairbrother (51), Craig Morgan for Quirke (53), Darragh Woods (0-01) for Gleeson (56), Conor Stakelum for Cahill (58), Michael Purcell for Flanagan (61). Limerick: Jamie Power; Brian Timmons, Josh Adams, John Flynn; Willie O’Meara (0-01), Kyle Hayes, Thomas Grimes; Paddy O’Loughlin (0-02, 0-02f), Mike Mackey; Barry Ryan (0-01), Brian Murphy (0-04, 0-03f), Conor Boylan (0-01); Peter Casey (0-01, 0-01f), Seamus Flanagan, Mark O’Dwyer. Subs used: Darren O’Connell for O’Dwyer (half-time), Oisin O’Reilly (0-01) for Flanagan (42), Micheal Houlihan (0-02, 0-02f) for Ryan (43), Kevin Howard (1-00) for Mackey (48), Brian O’Grady for Murphy (52).